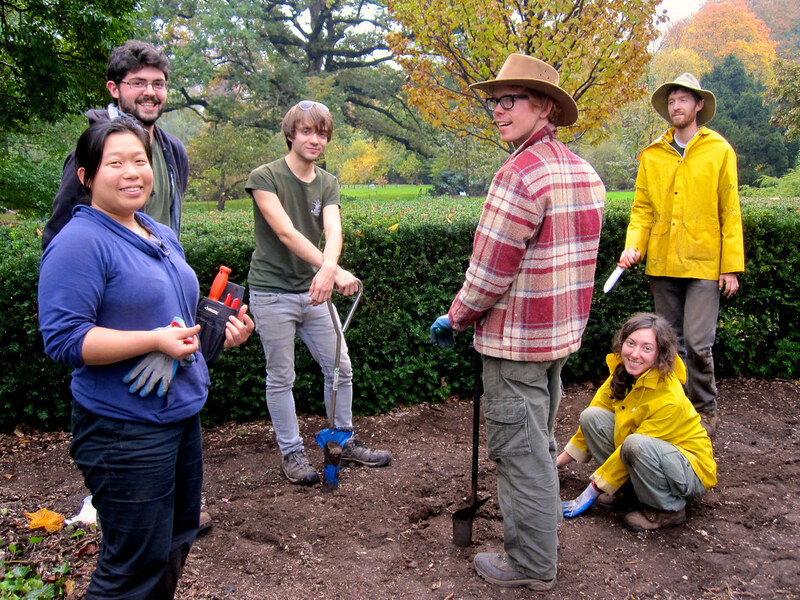 Brooklyn Botanic Garden offers an annual Horticulture Internship for individuals interested in pursuing a career in horticulture, from those who are just starting out to those with experience who are looking to explore new areas of the field. Interns commit to an eight-month, hands-on learning experience working directly with BBG's internationally respected horticulture staff. Internships are open to any adult over 18 years of age who has a strong interest in horticulture and some experience working outdoors (paid or unpaid). The applicant must be able to do physical labor outdoors and possess a valid driver’s license. Successful applicants must be able to work the full term and are responsible for their own housing. Applications are due on December 31, 2018. Please note that applications will not be reviewed prior to the due date. Leadership funding for the Horticulture Internship program has been provided by the Amy P. Goldman Foundation. BBG's Horticulture Internship provides both a solid education in the fundamentals of horticulture and practical work experience in preparation for a career in the field. Interns have a primary gardening assignment for the duration of the internship and two or more assigned mentors. Group projects, staff-taught workshops, and the Certificate in Horticulture program offer further training, and assisting at BBG’s Plant Sale and other Garden events affords interns opportunities to experience the wide variety of programs and initiatives at the Garden. Work Schedule: Monday through Friday, 8 a.m.–4 p.m., March 25 through December 6, 2019. To be accepted into the program, interns must be able to work the full eight months at 37.5 hours per week and are responsible for their own housing. There are nine intern positions available among the areas of focus listed below; applicants are asked for their top two choices for areas of focus (choices not guaranteed but will be matched as closely as possible). Most positions run from the last week of March through the first week of December. The Conservatory Work position runs from the end of February through the first week of November. Mentor assignments will be made in early 2019. For the Conservatory Work intern, the above topics will be applied to indoor plants and conservatory environments, along with the basics of propagation and nursery management. Become familiar with horticultural tools, equipment, and vehicles. Learn about career opportunities in horticulture and public gardens. Learn about the resources and operations of a botanic garden and the mission of BBG. Gain an appreciation for the global diversity of plants and people. Experience teamwork, cooperation, and responsibility. Horticulture interns are required to attend classes toward, and successfully complete, the BBG Certificate in Horticulture. The eight certificate courses are offered in the evenings by the Continuing Education department and are scheduled so that interns can complete the program by the end of their internship. Classes are free of charge to interns. Interns are generally offered three field trips during their term. This is a great opportunity to visit gardens and parks and experience different aspects of public horticulture. These field trips take place during the workday and are usually outside the New York City area. Past trips have included Old Westbury Gardens and Planting Fields Arboretum; Longwood Gardens and Chanticleer; and Rodale Farm Institute. Interns are encouraged (but not required) to undertake a six-month-long project during their internship. Garden resources include BBG’s 52 acres of gardens and plant collections, the Library, and the Horticulture team and other staff. Past projects have included a demonstration of making natural dyes from plants, research on heirloom seeds, a plan for improving nursery sustainability, and the uses of LED lighting in horticulture. Various group projects take place throughout the year, depending on the need and season. These are large-scale projects all the interns work on together, along with several Horticulture staff. One of the first group projects of the year is going through all the lawn areas to clean up after winter. Other group projects have included mulching the Cherry Collection trees, removing spent plants from display beds, cleaning out the border mounds, summer plantings for the Annual Border, and fall bulb planting. BBG's Horticulture interns planting bulbs on Magnolia Plaza. Photo by Blanca Begert. Horticulture intern Ronen Gamil trims a hedge. 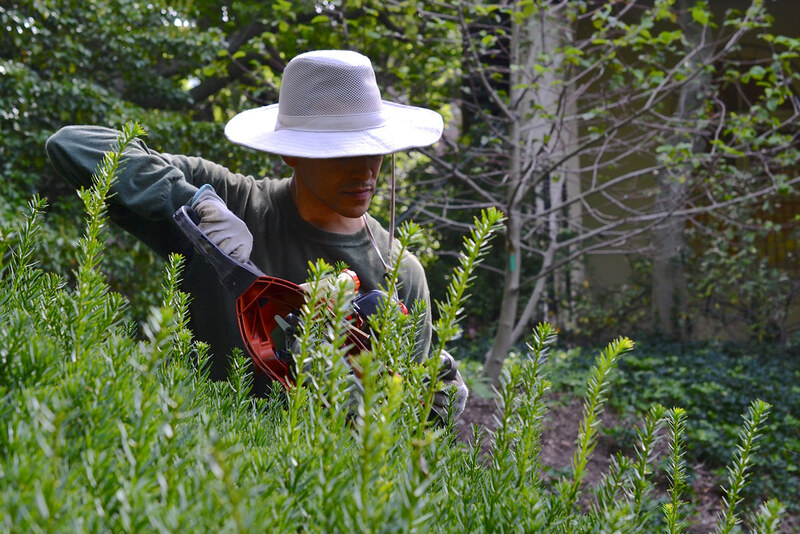 Learn about the job and internship opportunities at Brooklyn Botanic Garden.